to check out my super cute creations!! I was tired of losing my gypsy stylus pen and having a hard time pulling it out of the gypsy. 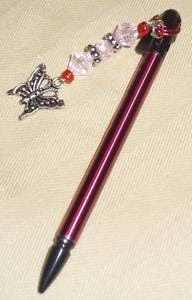 So, I created these cute and totally fun Stylus charms. I am selling them on ebay for $4.99 and I have a few styles to choose from. Different styles are in the works. So check them out and support my habit. Contact me if you want one!! Here's a super fun layout I made for the Skittles and Chocolate Orange Challenges! Fun Papers!! And this Birthday layout was made for the Take 5 and Almond Joy Challenges. Love the TLC kits...too bad they are not around anymore. We love you Bob Dole! Miss you tons! Pin It Just a few layouts done for the May Scrapping Days Challenges. This one was for Black Jack Gum...use a playing card on a layout. Pin It It's not too late to join in the fun!! StorytellersClub is hosting their May Scrapping Days. 30 days of scrapbooking challenges and prizes. Come join the fun! This year it is all about the Candy- Sugar Rush is the theme. Use pop dots and bling.